President Obama is travelling to Las Vegas Tuesday to headline a fundraiser for Sen. Reid. WASHINGTON (CNN) - A conservative group is taking aim at Senate Majority Leader Harry Reid, D-Nevada. "Our Country Deserves Better," a conservative political action committee, announced Monday it will air a television ad in an attempt to unseat Reid, who is seeking re-election in 2010. The organization said its campaign "will include a television, radio, and Internet advertising blitz throughout the state of Nevada reminding voters that Harry Reid has stiffed taxpayers with huge government bailouts and wasteful pork-barrel spending." The conservative PAC said it would spend over $100,000 in it's initial campaign and pledged to dish out over $1 million between now and the November 2010 midterm elections. "Republicans were successful in defeating Sen. Reid's predecessor, Tom Daschle, in 2004," said CNN Political Editor Mark Preston. "They have now focusing their efforts on trying to defeat another Democratic leader in the next election." The conservative organization's announcement comes one day before President Obama heads to Nevada to headline a fundraiser for the majority leader. And it comes one week after a poll of Nevada voters suggested that Reid could be very vulnerable as he gears up for re-election. According to the survey conducted by Mason-Dixon for the Las Vegas Review-Journal, only about a third of the state's voters said they would vote to re-elect Reid to a fifth Senate term, while 45 percent said they would definitely vote for another candidate. 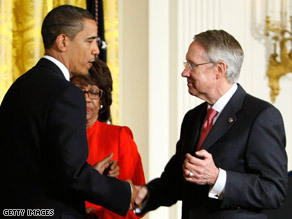 An additional 17 percent of voters say they would consider voting to oust Reid. The poll also suggested Reid's approval rating back home stands at a meager 38 percent, while about half of Nevada voters hold a negative view toward the Senate Majority leader. Jim Manley, a spokesman for Reid, brushed aside the poll results, saying, "Sen. Reid has never put a lot of weight in polls." Knocking Reid off in 2010 would be a huge victory for the GOP after suffering devastating losses in Congress as well as control of the the White House in the 2008 elections. But so far Republicans have not been able to find a credible candidate to run against Reid. "On paper, Sen. Reid is vulnerable," Preston said. "But the fact is Republicans do not have a candidate to challenge the majority leader. And Reid is well aware that he has a target on his back. He has said as much in fundraising solicitations to supporters and this is why President Obama is heading to Las Vegas so early in this election cycle. Reid understands that one way to thwart a serious challenger is to amass a huge political war chest, which is what he is doing." Reid captured 61 percent of the vote in his re-election in 2004. He's also raising campaign cash at an impressive clip, amassing more than $2 million in his war chest during the first quarter of the year. Also working in Reid's favor, Nevada demographics. former President George W. Bush won the state in 2000 and 2004, but Barack Obama easily carried the state in last November's election. I love it! democrats use and abuse PAC's..ACORN is a supposedly 'neutral' non-profit...and they get bent about this?!? truth is...on this Memorial Day...Harry Reid is a punk who disrespected my branch many years ago. he can go straight to hell as far as i'm concerned! Personally I think the Country is starting to do much better since Republicans lost power lets keep it that way! Our Country GOT better in November- That's why we have elections! The gop still doesn't seem to realize that they lost BIG TIME- their "ideas" rejected soundly, and their fear and smear methods just won't work anymore. This story is entirely about Reid, yet Liberals will deflect the arguments to Rove, Cheney, Bush, and Rush? Where is the logic in that? There are plenty of Democrat voices out there that have said the same thing this article does, that the country deserves better than Reid. He and Pelosi are poisons, just like Cheney was (past tense) and Rush is (present tense). If you are a Democrat and don't believe that, then you are clearly a blind sheep who pays no attention to anything but colors like Red vs Blue. Reid and Pelosi should both resign. Ever since the election they've been running Congress as if THEY were elected president, making things worse and worse with their lies, their division, and complete incompetence!